IDEA guarantees that a child with a disability will receive a free appropriate public education in the least restrictive environment (LRE) appropriate. This principle reflects IDEA’s strong preference for educating students with disabilities in general education classes with the access to general education curriculum. Placement in the general education classroom is the first placement option the IEP team must consider. When considering placement in the general education classroom, the team is required to explore the range of modifications and supplementary aids and services that are needed to ensure that the student can receive a satisfactory education in the general education classroom. If the IEP team determines that the student can be appropriately educated in the general education classroom using modifications/supplementary aids and services, this is the LRE for that particular student. However, the IEP team may determine that the student cannot be educated satisfactorily in the general classroom, even with the provision of modifications and supplementary aids and services. The team must then consider other placements outside of the general classroom in order to provide FAPE for the child. The range of such placements that each school system is required to have available is commonly referred to as the “continuum of alternative placements.” Thus, like all other components of a student's special education, the LRE must be determined for each student based upon that child’s individual needs. 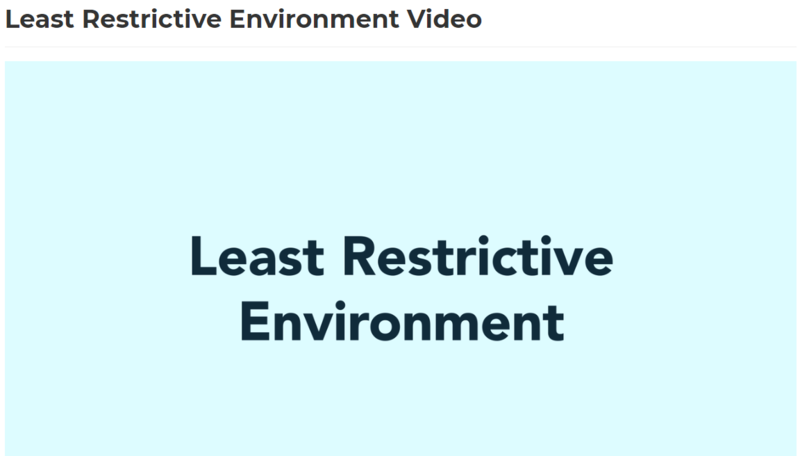 Select the image above to view a video on Least Restrictive Environment from OCALI.